There I was. On Hoth. The actual Hoth. 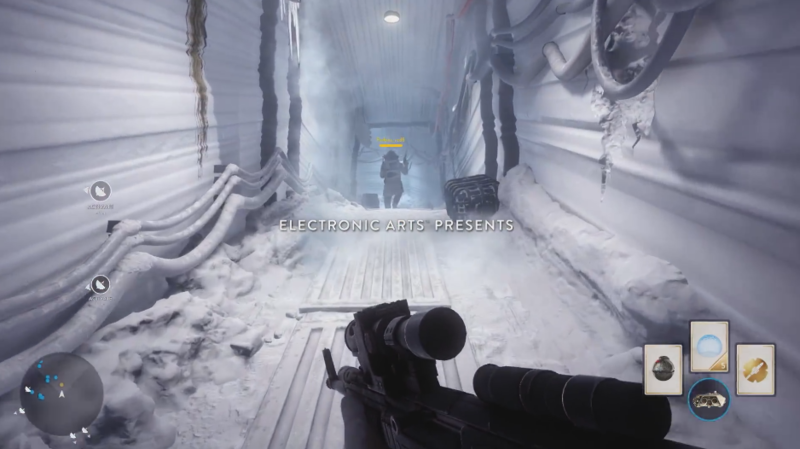 OK, so not the actual fictional place called Hoth, but it was a stunning recreation of the location from the Star Wars movies and was just the first in a number of moments, visuals, and sounds that show how faithfully DICE respected the original medium that their game derives from. Being able to easily swap between third-person and first-person, the game really starts to feels like the classic Battlefront that we know and love. I opt for the third-person view and charge through the trenches, sounds of laser blasts roaring around me. I’d love to say that Star Wars Battlefront was everything that I dreamed it would be, and all that I had been hoping for, and perhaps it is, but nostalgia is a fickle beast. Having not played a Battlefront game in about a decade, I realized that DICE’s faithful recreation of the title we knew and loved may be stuck in a time capsule. My 15 minutes or so with the game presented me with some doubts. While my one gameplay session was a lot of fun, I can see the game losing my interest if the relative simplicity that was showcased in the demo doesn’t have some Force Lightning shot into it. Though maybe that simplicity is exactly what fans are looking for to avoid a convolution of the incredible recreation of Star Wars with unnecessary FPS mechanics. It’s a balance that DICE and EA have to find, and I am glad I’m not the one making that decision. The massive 40-player battlefield is impressive, but time to kill seemed to be very high –though not quite Battlefield Hardline high — and I never felt like my actions were accomplishing much for my team because I was just a pawn in this grand scheme of things. For anyone worried that this would just be a Star Wars skin for a Battlefield game though, you can rest assured that it doesn’t feel that way, but perhaps it would not have been a bad thing to let a little bit more of their experience with Battlefield bleed in around the edges to spice things up. My hands-on time with it was just a 15-minute window into the game however, so it’s hard to tell if that quality is inherent to the game or just to my experience with it thus far. The Battle for Hoth is one of the most iconic in Star Wars history, but after my small campaign, I didn’t feel the desire to play it again, which makes me fear that the overall wow factor of how faithfully this game recreates Star Wars could be a flash in the pan for players looking for something a little longer term. That being said, the demo felt very much like a showcase of what they had done with the Star Wars brand as opposed to giving a deep look at the gameplay and options that the game will have, and in that respect they succeeded. Visuals, audio, and the overall emotion of the frantic battle were all familiar for the Star Wars faithful. The gameplay feels like Battefront 2, or at least what I can remember of it from 10 years ago. Capturing both arrays brought the massive AT-AT to a halt, and my team of rebels began the assault on it. I never made it into a vehicle myself to experience the aerial combat, but my time on the ground was exhilarating, defending and taking points from the Empire’s forces, being a small part of that Rebel Alliance. I do wish I’d had more time with it to experience the different ways you could play, or how being on the opposing team affected the gameplay, but so far I can see the potential for Battlefront. I’m hoping that as we see more of Star Wars Battlefront in the future, it doesn’t just rely on its license, but backs it up with strong, fun, and varied gameplay that will keep players coming back to relive each of those key battles over and over again. This showing was all about what EA and DICE could do with Star Wars, now we just need to see more of the core gameplay components that will make up the final game as opposed to a demo that felt quite a bit Force Choked.